Discovery Guide James Washington, III, better known at the Houston Museum of Natural Science as “Jurassic James,” has made a career out of going above and beyond the call of duty. 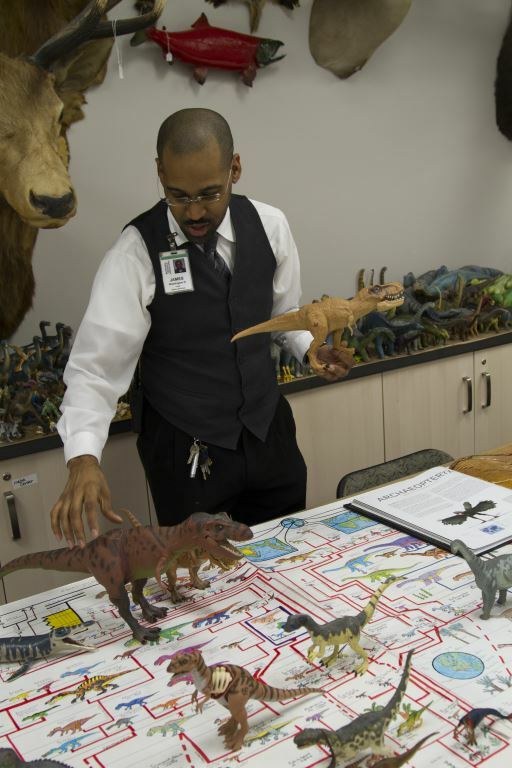 James Washington shows off his collection of model dinosaurs, which he has been compiling since he was a young boy. They have since been repurposed into a wildly successful training regimen for HMNS employees. 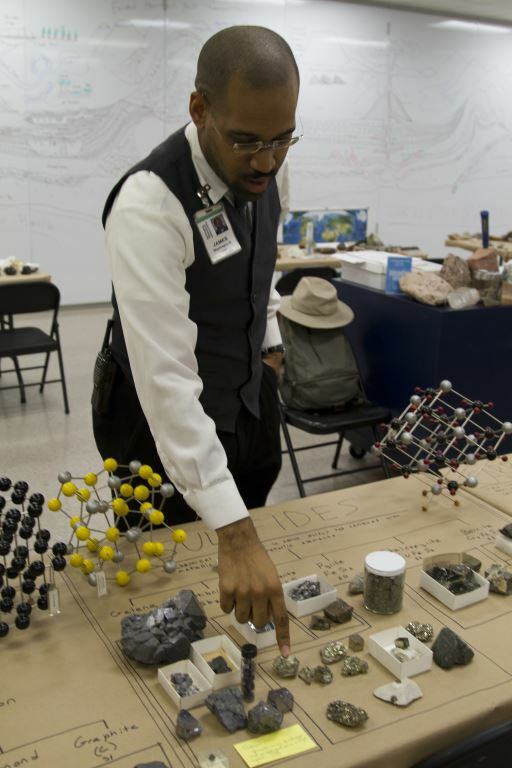 Five years ago, Washington was tutoring Geology at Lone Star College when his students were offered extra credit for visiting the Cullen Hall of Gems & Minerals at HMNS. He volunteered to spend his Saturdays giving free tours for his students and made an impression on museum staff in the process. Washington explains the properties of the mineral pyrite by comparing several examples with other similar minerals. “The guy who interviewed me was like, ‘You look familiar.’ I told him I did a tour here last weekend for some students. So, they hired me on in front-line visitor services,” Washington said. Washington could do it all and was quickly promoted into the concierge program before becoming one of the first of the museum’s full-time Discovery Tour Guides. He continued to do extra work that was technically someone else’s job, scheduling tours and handling requests, eventually earning a promotion to Concierge Lead. 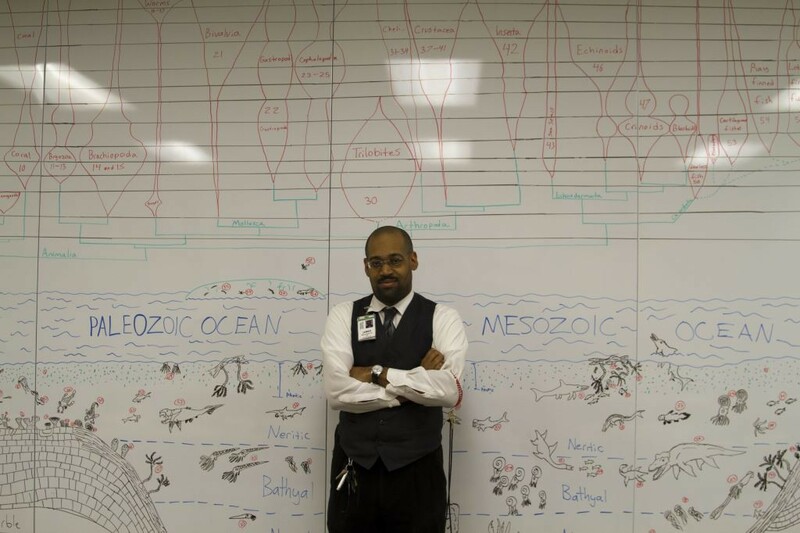 Washington stands before the extensive whiteboard diagrams he drew to model the prehistoric Paleozoic and Mesozoic oceans. Over the years, Washington has collected fossils, artifacts, and model animals and dinosaurs. 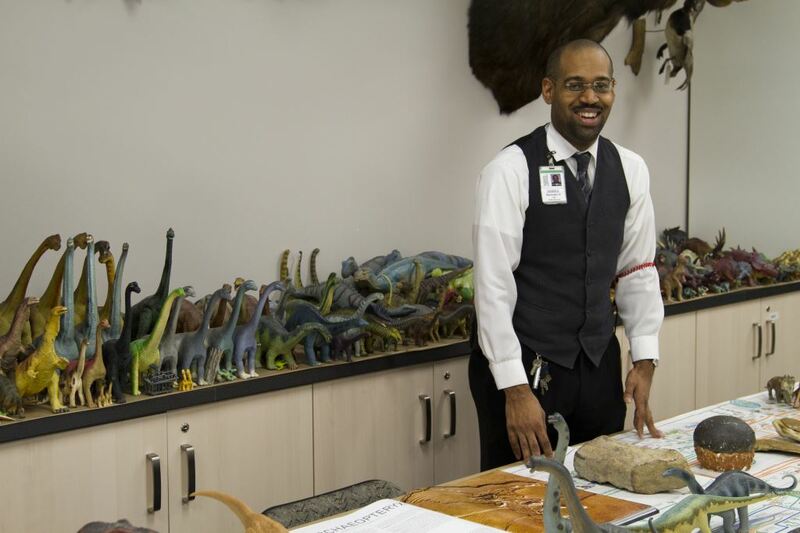 Beginning in the fall of 2014, much of that collection made its way to the HMNS basement into a special training classroom Washington developed for the concierge program. 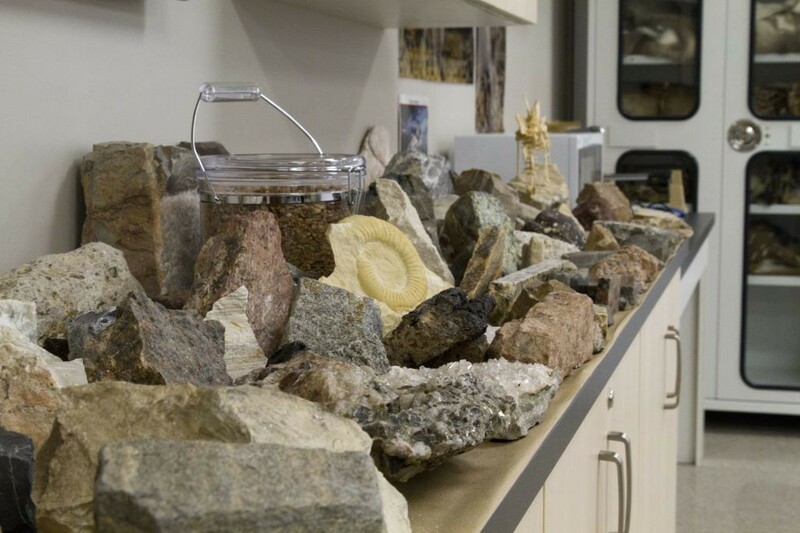 Since that time, the classroom has expanded from one room to three and has grown to cover more topics including geology, paleontology, and more. 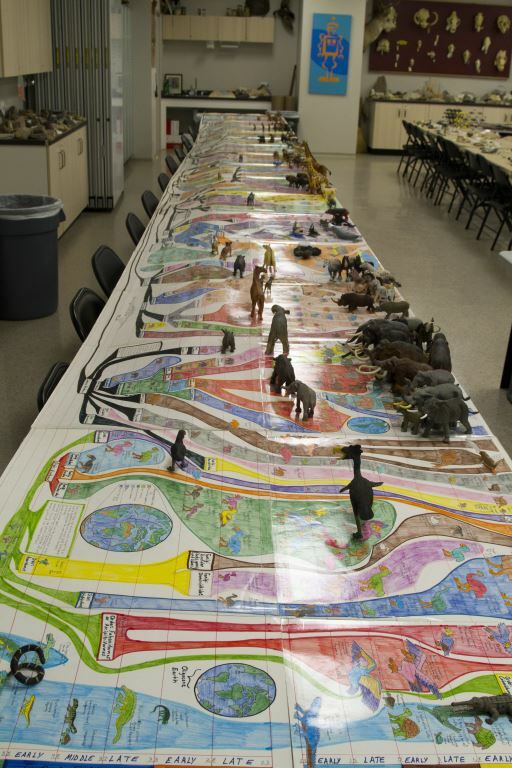 An entire counter is filled with colorful plastic dinosaur models, a long row of folding tables models the evolution of numerous animal species, and the walls are covered in dry-erase drawings of volcanoes, oceanic layers, and prehistoric reptile anatomy. It’s the end-result of years of hard work. Washington hand-drew and colored this 20-foot-long poster board modeling the evolution of life over time, completing the display with models from his personal collection. “I just kept bringing more and more stuff in and reorganizing. This is not in my job description; I’m only supposed to do tour scheduling, but I end up doing two Adult Education classes and now some home-school classes in the fall,” Washington said. “Every once in a while, I feel sorry for whoever replaces me,” he added with a grin. Washington has always wanted to be a science teacher, specifically at the university-level, but for now, his work at the museum allows him to explore the depths of a variety of subjects. “I like learning about ancient history and earth science and biology and animals and I don’t want to commit to learning just one of those concepts forever. The museum facilitates that. I can learn everything I want and apply it,” Washington said. Geologic specimens Washington collected over the years on various digs and field excursions cover this counter in the Museum’s basement. Washington demonstrates the differences between two versions of Tyrannosaurus rex that appeared in two different Jurassic Park films to show how human understanding of prehistoric life has changed over time. Today, coming up on four years as an employee, Washington is thankful for the opportunities afforded him. He still can’t believe he works here. Children and adults alike love accompanying “Jurassic James” on his tours. Visit the museum today, and take one for yourself! James gave us a private tour two years ago, maybe three, when the hall of paleontology opened. It was toward the end of a rainy day and we were so fortunate to have James and the museum to ourselves even after the museum closed! James is a treasure! We speak fondly of that tour all the time! I always felt guilty for not writing the museum to express our praise of him, but now I am! I’m so happy James is still a valued member of HMNS! Can you help me follow up about the arrowhead I found and showed you on our tour?